Al Jamal Hotel is a new and modern hotel with expert and advanced services. Al Jamal Hotel is located in the capital city of Jordan. It is characterized by its advanced services in the field of hotel business and always seeks to develop the infrastructure and services provided to customers and gain their trust and satisfaction by measuring the satisfaction with the performance and services provided to him and the experience he experienced during his stay at the hotel. 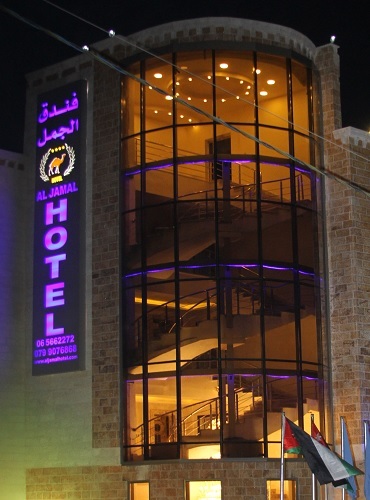 We have chosen our location to meet the needs of our diverse guests, Al Jamal Hotel is located close to the University Hospital, Al Hussein cancer Center hospital and the University of Jordan and also close to the commercial markets in Amman and just 45 minute drive from Queen Alia International Airport. We are not the only ones in this field, but we strive to be the best. Winning customer satisfaction is our ultimate goal and goal that we always strive for. We always develop the quality of our services to meet the highest standards and are in line with the latest developments. We have extensive experience in hotel business and hotel services and are always in line with customer requirements. We develop our expertise to be a strong competitor in the hotel industry. Aljamal Hotel is a situated in a prime location in western Amman, conveniently close to major corporate offices, shopping centers, offices, hospitals, university of jordan,Hospitals (king al hussien cancer center,Al Isra hospital, University of jordan hospital), and just 45 minute drive from Queen Alia International Airport .